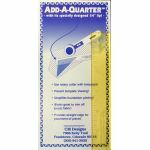 The Add-A-Quarter combines the speed of rotary cutting quilt pieces with the accuracy of using templates. 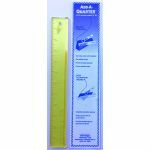 Once your templates are made, the Add-A-Quarter will automatically add the customary 1/4" seam allowance to any straight angle and provide a straight edge for you rotary cutter. 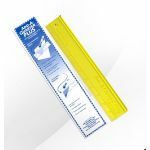 A 10% donation will be made to breast cancer research when purchasing this product.